Today I went to the libelle summer week, it's kind of a Fair. They have like all these stalls where they have cosmetics, food, stuff for in and around house and so on. Most of the things you can try before you buy. And also you can taste a lot of food without buying it. Anywayz they have a lot of fun stuff, for cheaper then in the stores and somethings even before they're sold in the stores in my country. Also a lot of online stores are having a stall, which is easier then actually buying online because you can see it in person. I actually thought that I bought a lot because I got a free bag that was quite big at the beginning. And I was like everything we buy has to go in here to fill it up. So my sister and mom dropped everything the bought in the bag. To make a long story short at the end I was dragging around with there stuff. And when I came home I discovered that I actually didn't buy a lot. Anywayz here are some pictures of what I got. I first bought three small therme bath oil, I used to have the big bottle. But that one was sold out, and in the stores they're €9 but at the libelle they're €3. So I still wanted a bottle so I bought three small ones for €3. They still sold other scents but I really wanted the lavender one because that one smells amazing! Then I went on a nailpolish hunt, and the first thing stall that sold nailpolishs I like was Rimmel. They did this thing with 3 items for €15. I got as 'topcoat' ~ express brush ~ 60 seconds in ~ 720 Star studded. And the lycra PRO professional finish up to 10 days ~ 400 Blue vogue & 287 Bahamas flirt. Don't know if they really last up to 10 days. We will see ! Then my sister saw an OPI stall and I run up to it as soon as I could when she told me they still sold the silver shatter. Because in my country the silver shatter was sold out within a day. 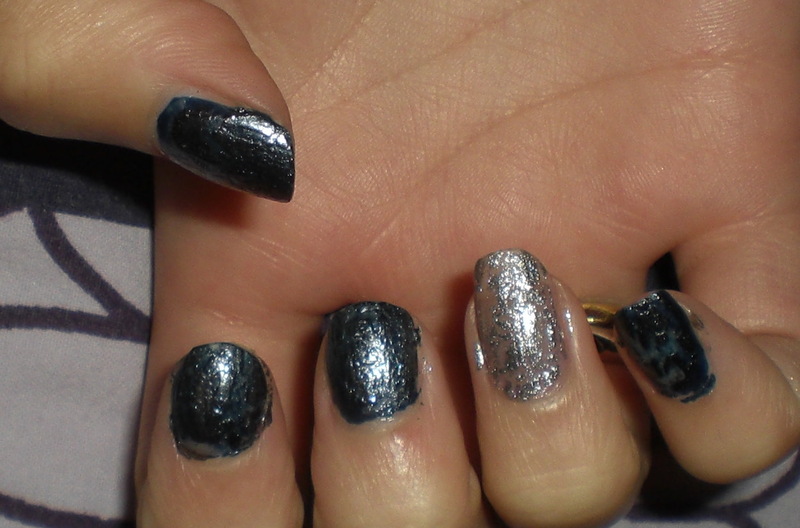 I really love the blackshatter and the silver shatter is also pretty, if you ask me, but different. I just had to have it and it was also a lot cheaper then in the stores. So happy I finally bought it, because I love the shatters. The only reason why I didn't buy the red one was because I know I'm not going to wear it. Red is not my colour. My mom bought this nail file made of glass for me. They're better for your nails and they also give a nicer finish and regular nail files. I used to have a big one with diamond on it and small one smilair to this one only with blue and gold. Only the bigger one broke and I don't know where the other one went to after my sister barrowed it. Anywayz I love this nail file ! Then my sister gave me these pair of sunglasses. She got them with a bottle of booze. The weird thing is that they also gave her a lipgloss and a nail file with the booze. If you asked my they could better give lemons and ice with it haha. Last but not least, My mom and I finally bought a massage thing for on you're chair. Or actually between you and your chair. And when you turn it around you have a foot massage holder. Ever year my mom and I are looking at this kind of massage stuff but we never buy it because it's quite expensive. This year we found this thing and it wasn't expensive at all. That's probably because it's a very simple machine. Nothing like too different ways of massaging you. It actually only vibrates, but it does the job. Because if I have myalgia [muscle pain] and I hold this thing against it, it actually goes away ! And it is relaxing. So I'm pretty happy with it. That was actually everything I got. by the different nail I put on bahamas flirt or lady in black instead of blue vogue. I replaced the black shatter for the silver shatter. And I didn't use the star studded nail polish. Thank so much for this! I haven’t been this moved by a post for a long period of time! You have got it, whatever that means in blogging. Anyway, you’re definitely somebody that has something to say that people need to hear. Keep up the great work. Keep on inspiring the people! Therapeutic Massage is a very effective technique for controlling pain.we remove painrelieve foot pain with use the vibe vibration massager.